Lincoln Cathedral or the Cathedral Church of the Blessed Virgin Mary of Lincoln, and sometimes St. Mary's Cathedral in Lincoln, England is the seat of the Anglican bishop. Building commenced in 1088 and continued in several phases throughout the medieval period. It was the tallest building in the world for 238 years (1311–1549), and the first building to hold that title after the Great Pyramid of Giza. The central spire collapsed in 1549 and was not rebuilt. The cathedral is the third largest in Britain (in floor area) after St Paul's and York Minster, being 484 by 271 feet (148 by 83 m). It is highly regarded by architectural scholars; the eminent Victorian writer John Ruskin declared: "I have always held... that the cathedral of Lincoln is out and out the most precious piece of architecture in the British Isles and roughly speaking worth any two other cathedrals we have." 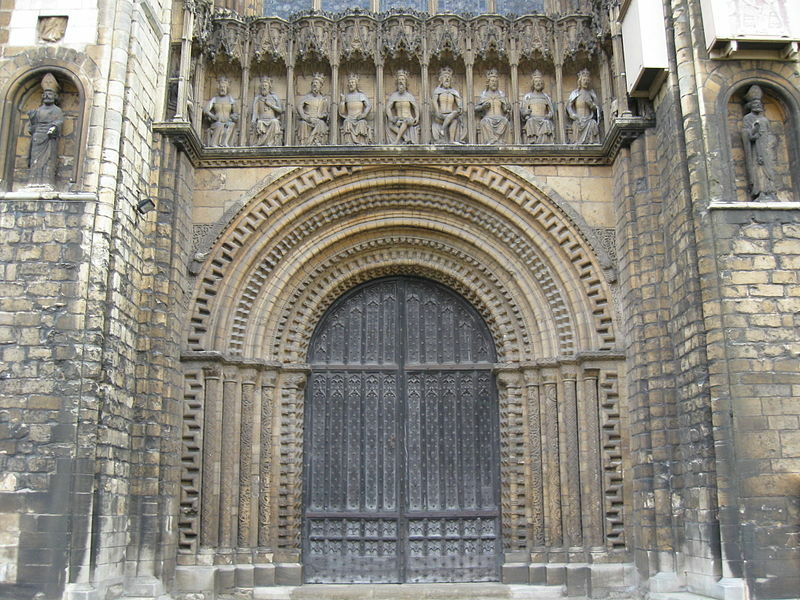 Remigius de Fécamp, the first Bishop of Lincoln, moved the episcopal seat (cathedra) there "some time between 1072 and 1092" About this, James Essex writes that "Remigius ... laid the foundations of his Cathedral in 1088" and "it is probable that he, being a Norman, employed Norman masons to superintend the building ... though he could not complete the whole before his death." Before that, writes B. Winkles, "It is well known that Remigius appropriated the parish church of St Mary Magdalene in Lincoln, although it is not known what use he made of it." Up until then St. Mary's Church in Stow was considered to be the "mother church" of Lincolnshire (although it was not a cathedral, because the seat of the diocese was at Dorchester Abbey in Dorchester-on-Thames, Oxfordshire). 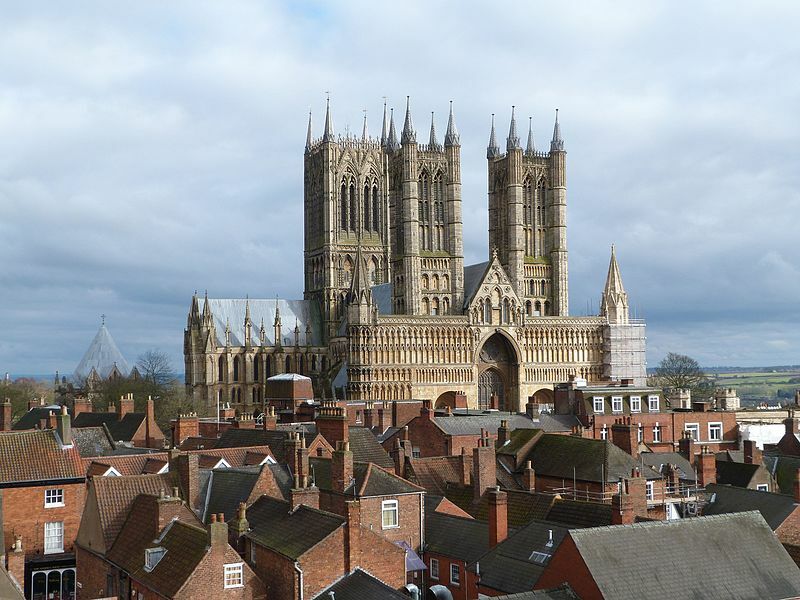 However, Lincoln was more central to a diocese that stretched from the Thames to the Humber. Remigius built the first Lincoln Cathedral on the present site, finishing it in 1092 and then dying on 7 May of that year, two days before it was consecrated. In 1141, the timber roofing was destroyed in a fire. Alexander (bishop, 1123–48) rebuilt and expanded the cathedral, but it was mostly destroyed by an earthquake about forty years later, in 1185 (dated by the British Geological Survey as occurring 15 April 1185). The earthquake was one of the largest felt in the UK: it has an estimated magnitude of over 5. The damage to the cathedral is thought to have been very extensive: the Cathedral is described as having "split from top to bottom"; in the current building, only the lower part of the west end and of its two attached towers remain of the pre-earthquake cathedral. Some have suggested that the damage to Lincoln Cathedral was probably exaggerated by poor construction or design; with the actual collapse most probably caused by a vault collapse. After the earthquake, a new bishop was appointed. He was Hugh de Burgundy of Avalon, France, who became known as St Hugh of Lincoln. He began a massive rebuilding and expansion programme. With his appointment of William de Montibus as master of the cathedral school and chancellor, Lincoln briefly became one of the leading educational centres in England, producing writers such as Samuel Presbiter and Richard of Wetheringsett, though it declined with importance after William's death in 1213. Rebuilding began with the choir (St Hugh's Choir) and the eastern transepts between 1192 and 1210. The central nave was then built in the Early English Gothic style. Lincoln Cathedral soon followed other architectural advances of the time, pointed arches, flying buttresses and ribbed vaulting were added to the cathedral. This allowed support for incorporating larger windows. There are thirteen bells in the south-west tower, two in the north-west tower, and five in the central tower (including Great Tom). Accompanying the cathedral's large bell, Great Tom of Lincoln, is a quarter-hour striking clock. The clock was installed in the early 19th century. "For north represents the devil, and south the Holy Spirit and it is in these directions that the two eyes look. The bishop faces the south in order to invite in and the dean the north in order to shun; the one takes care to be saved, the other takes care not to perish. With these Eyes the cathedral’s face is on watch for the candelabra of Heaven and the darkness of Lethe (oblivion)." After the additions of the Dean's eye and other major Gothic additions it is believed some mistakes in the support of the tower occurred, for in 1237 the main tower collapsed. A new tower was soon started and in 1255 the Cathedral petitioned Henry III to allow them to take down part of the town wall to enlarge and expand the Cathedral, including the rebuilding of the central tower and spire. They replaced the small rounded chapels (built at the time of St Hugh) with a larger east end to the cathedral. This was to handle the increasing number of pilgrims to the Cathedral, who came to worship at the shrine of Hugh of Lincoln. In 1290 Eleanor of Castile died and King Edward I of England decided to honour her, his Queen Consort, with an elegant funeral procession. After her body had been embalmed, which in the 13th century involved evisceration, Eleanor's viscera were buried in Lincoln cathedral and Edward placed a duplicate of the Westminster Abbey tomb there. The Lincoln tomb's original stone chest survives; its effigy was destroyed in the 17th century and replaced with a 19th-century copy. On the outside of Lincoln Cathedral are two prominent statues often identified as Edward and Eleanor, but these images were heavily restored in the 19th century and they were probably not originally intended to depict the couple. Between 1307 and 1311 the central tower was raised to its present height of 271 feet (83 m). The western towers and front of the cathedral were also improved and heightened. At this time, a tall lead-encased wooden spire topped the central tower but was blown down in a storm in 1549. With its spire, the tower reputedly reached a height of 525 feet (160 m) (which would have made it the world's tallest structure, surpassing the Great Pyramid of Giza, which held the record for almost 4,000 years). Although there is dissent, this height is agreed by most sources. Other additions to the cathedral at this time included its elaborate carved screen and the 14th-century misericords, as was the Angel Choir. For a large part of the length of the cathedral, the walls have arches in relief with a second layer in front to give the illusion of a passageway along the wall. However the illusion does not work, as the stonemason, copying techniques from France, did not make the arches the correct length needed for the illusion to be effective. In 1398 John of Gaunt and Katherine Swynford founded a chantry in the cathedral to pray for the welfare of their souls. In the 15th century the building of the cathedral turned to chantry or memorial chapels. The chapels next to the Angel Choir were built in the Perpendicular style, with an emphasis on strong vertical lines, which survive today in the window tracery and wall panelling. Hugh of Wells, Bishop of Lincoln, was one of the signatories to Magna Carta and for hundreds of years the cathedral held one of the four remaining copies of the original, now securely displayed in Lincoln Castle. The Lincoln Magna Carta was on display at the British Pavilion during the 1939 New York World's Fair. In March 1941, the Foreign Office proposed that the Lincoln Magna Carta be gifted to the United States, citing the "many thousands of Americans who waited in long queues to view it" and the US passage of the Lend-Lease Act, among other reasons. In 2009 the Lincoln Magna Carta was lent to the Ronald Reagan Presidential Library in Simi Valley, California. There are three other surviving copies; two at the British Library and one at Salisbury Cathedral. In August 1255 the body of an eight-year-old boy was found in a well in Lincoln. He had been missing for nearly a month. This incident became the source of a blood libel in the city, with Jews accused of his abduction, torture, and murder. Many Jews were arrested and eighteen were hanged. The boy became named as Little Saint Hugh to distinguish him from Saint Hugh of Lincoln, but he was never officially canonised. The cathedral benefited from these events because Hugh was seen as a martyr, and many devotees came to the city and cathedral to venerate him. Geoffrey Chaucer mentions the case in "The Prioress's Tale" and a ballad was written about it in 1783. In 1955 a plaque was put up near "the remains of the shrine of 'Little St Hugh'" in the cathedral, that decries the "Trumped up stories of 'ritual murders' of Christian boys by Jewish communities." One of the stone carvings within the cathedral is the Lincoln Imp. There are several variations of the legend surrounding the figure. According to 14th-century legend, two mischievous imps were sent by Satan to do evil work on Earth. After causing mayhem elsewhere in Northern England the two imps headed to Lincoln Cathedral, where they smashed tables and chairs and tripped up the Bishop. An angel appeared in the Angel Choir and ordered them to stop. One of the imps sat atop a stone pillar and started throwing rocks at the angel whilst the other cowered under the broken tables and chairs. The angel turned the first imp to stone, allowing the second imp to escape. The imp that turned to stone can still be found sitting atop his stone column in the Angel Choir. 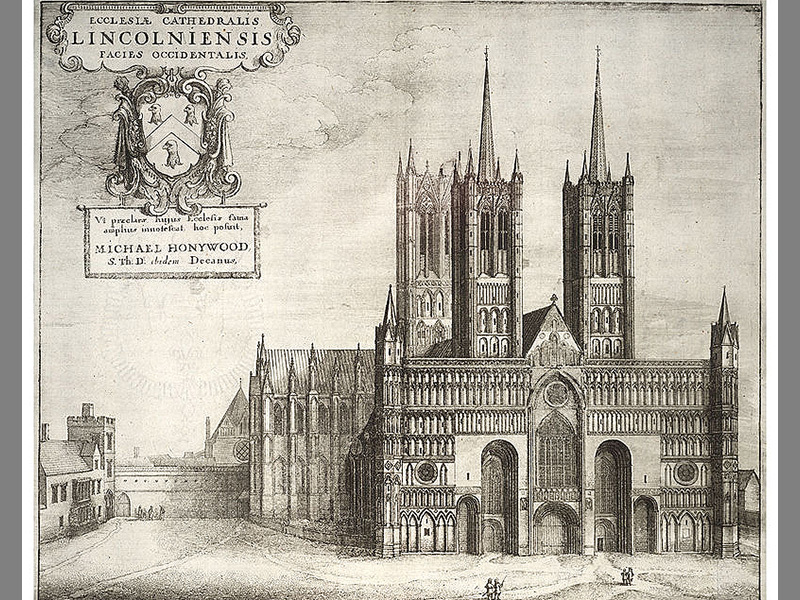 Michael Honywood was made Dean of Lincoln at the Restoration of the Monarchy in 1660, with the huge task of repairing the fabric of the cathedral, ravaged by the Parliamentarian soldiers during the Civil War. General repairs took him until 1674, when he was finally able to begin his cherished project of providing a new library building with £780 of his own money on the site of the ruined north cloister. Honywood commissioned the design from Sir Christopher Wren, who also supervised throughout, as is indicated by a page which survives in the Cathedral collections, setting out the prices for painting and gilding, and written and signed by Wren. The external Tuscan Doric colonnade of the exterior is serenely classical yet the inside is full of Baroque features: advancing and receding planes and cornice, which give interest to a long, narrow room; and the trompe l'oeil marbling. Through removal of the added paint layers some of the original marbling has been revealed; where it has not been revealed (due to expense and conservation concerns) a reproduction marbling has been painted over the layers. The terms laid out in the contracts for the building specified that the building should be completed in two years. He bequeathed his 5,000 books (including one of only 250 manuscript versions of Chaucer's Canterbury Tales) to the Dean and Chapter - these are still in the building built for them. Lincoln is one of only two surviving Wren libraries; the other is the Wren Library of Trinity College, Cambridge, designed by Wren in 1676. The devotional books include an illuminated Book of Hours which is small enough to fit into a pocket. In the mediaeval era the manuscripts were kept in a chest or cupboard, and scholars came from great distances to consult them. By 1422 a new, chained library had been built over the east walk of the Cloister, adjoining the Chapter House. Three of the mediaeval reading desks and one bench survive in the Mediaeval Library, which was built to accommodate around a hundred manuscripts. The Bishop's Eye rose window. Lincoln Cathedral features two major rose windows, which are a highly uncommon feature among medieval architecture in England. On the north side of the cathedral there is the “Dean's Eye” which survives from the original structure of the building and on the south side there is the “Bishop's Eye” which was most likely rebuilt circa 1325–1350. This south window is one of the largest examples of curvilinear tracery seen in medieval architecture. Curvilinear tracery is a form of tracery where the patterns are continuous curves. This form was often done within pointed arches and squared windows because those are the easiest shapes, so the circular space of the window was a unique challenge to the designers. A solution was created that called for the circle to be divided down into smaller shapes that would make it simpler to design and create. Curves were drawn within the window which created four distinct areas of the circle. This made the spaces within the circle where the tracery would go much smaller, and easier to work with. This window is also interesting and unique in that the focus of the tracery was shifted away from the centre of the circle and instead placed in other sections. The glazing of the window was equally as difficult as the tracery for many of the same reason; therefore, the designers made a decision to cut back on the amount of iconography within the window. Most cathedral windows during this time displayed many colourful images of the bible; however at Lincoln there are very few images. Some of those images that can be seen within the window include saints Paul, Andrew, and James. Wooden trusses offer a solid and reliable source of support for building because, through their joints, they are able to resist damage and remain strong. Triangles are the strongest shape because, no matter where the force is being placed on them, they are able to use their three joints to their fullest extent to withstand it. Making trusses with triangles inside larger triangles adds even more strength, as seen in Lincoln's choir. The design of all wooden trusses is a tedious task as there are many different things that need to be considered while building these supports. There are many different ways that the trusses can fail, if they are not designed or built properly; it is therefore crucial to design trusses that suit a specific building with specific needs in mind. The simplest form of a truss is an A-frame; however, the great amount of outward thrust generated by this often causes the truss to fail. The addition of a tie beam creates a triangular shape, although this beam can sometimes sag if the overall truss is too large. Neither one of these types would have been suitable for Lincoln, owing to the sheer size of the roof. They would have failed to support the building, so collar beams and queen posts were added to help prevent sagging. To protect against wind damage, braces were added. Secondary rafters were also added to the design to ensure that the weight was equally distributed. Saint Hugh's Choir has a total of thirty six trusses keeping the roof in place, and it is held up entirely by means of its own weight and forces. 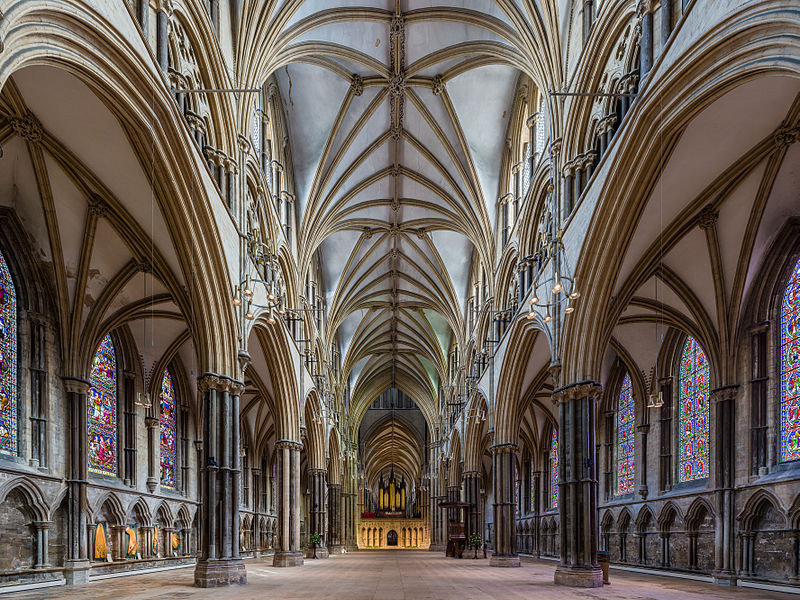 One major architectural feature of Lincoln Cathedral are the spectacular vaults. The varying vaults within the cathedral are said to be both original and experimental. The vaults especially, clearly define the experimental aspect seen at Lincoln. There are several different kinds of vaults that differ between the nave, aisles, choir, and chapels of the cathedral. Along the North Aisle there is a continuous ridge rib with a regular arcade that ignores the bays. Meanwhile, on the South Aisle there is a discontinuous ridge rib that puts an emphasis on each separate bay. The North West Chapel has quadripartite vaults and the South Chapel has vaults that stem from one central support columns. The use of sexpartite vaults allowed for more natural light to enter the cathedral through the clerestory windows, which were placed inside of each separate bay. Saint Hugh's Choir exhibits extremely unusual vaults. It is a series of asymmetrical vaults that appear to almost be a diagonal line created by two ribs on one side translating into only a single rib on the other side of the vault. This pattern divides up the space of the vaults and bays, perfectly placing the emphasis on the bays. The chapter house vaults are also interesting. It is a decagonal building with a single, central column that twenty ribs rise from. Each separate area of Lincoln can be identified solely by the different vaults of the space. Each vault, or each variation of the vault, is fresh and original. They illustrate innovative thinking and great creativity. There is no doubt that these vaults, and all of the other experimental aspects of Lincoln came with a slight risk. A clock by John Thwaite was installed in the north west tower in 1775. This was later improved by Benjamin Vulliamy and moved to the broad tower around 1835. It was replaced in 1880 by a new clock under the instruction of Edmund Beckett QC. The clock was built by Potts and Sons of Leeds. Cambridge Chimes were a feature of the new clock. The clock featured a double three-legged gravity escapement to the designs of Edmund Beckett. The machinery weighs about 4 long tons (4.5 short tons), with the driving weights being 1.5 long tons (1.7 short tons), suspended by steel-wire ropes 270 feet (82 m) long, and the pendulum weight of 2 long hundredweight (100 kg). The beat is 1.5 seconds. The hour hammer is 224 pounds (102 kg), striking upon Great Tom. The striking trains require winding daily, when done manually it took 20 minutes. The going train required winding twice per week. The clock mechanism contains the inscription: Quod bene vortat Deus Opt. Max., Consiliis Edmundi Beckett, Baronetti, LL.D., Opera Gul. Potts et Filiorum, civium Leodiensium, Sumptibus Decani et Capituli, Novum in Turri positum est Horologium, A.D. MDCCCLXXX. The choir is currently formed of ten men (who are either lay vicars or choral scholars), a team of about 20 boys and a team of about 20 girls. The cathedral accepted female choristers in 1995. Lincoln was only the second cathedral in the country to adopt a separate girls' choir (after Salisbury Cathedral) and remains one of few who provide exactly the same musical opportunities and equal weekly singing duties to both girls and boys. All the choristers are currently educated at Lincoln Minster School. The director of music is Aric Prentice, who conducts the choir of boys and men, and the assistant director of music and sub-organist is Jeffrey Makinson, who conducts the choir of girls and men. The organist laureate is Colin Walsh, previously organist and master of the choristers. The assistant organist is Hilary Punnett. Like any great cathedral, Lincoln has had its share of organists who have achieved international renown: perhaps the most famous is William Byrd, the Renaissance composer. Although it is uncertain whether Byrd was born in Lincoln as has been claimed, he was organist at the cathedral from 1563 until 1572 and continued to compose works specifically for the cathedral choir after his departure. The organ is one of the finest examples of the work of "Father" Henry Willis, dating from 1898. It was Willis' last cathedral organ before his death in 1901. It has undergone two restorations, in 1960 and 1998, by Harrison & Harrison. The organ specification can be found in the National Pipe Organ Register. The installation of a new organ was made possible in 1898, after a donation by a Lincoln industrialist, Alfred Shuttleworth, of £1,000 towards the total cost of £4,675 (equivalent to £480,000 in 2016). The remainder was met by several other individual donations and public subscription. The organ is one of only two Willis organs in English cathedrals which retain their original tonal scheme. The new organ, based on Willis's 1885 design, was dedicated on St Hugh's Day, 17 November 1898. It was intended to be the first British cathedral organ to be electrically powered. As Lincoln's power station had not yet entered service, however, it had to be pumped manually by soldiers of the Lincolnshire Regiment. Lincolnshire was home to many Bomber Command airfields during the Second World War, giving rise to the nickname of 'Bomber County'. The station badge for the nearby RAF Waddington depicts Lincoln Cathedral rising through the clouds. Until the opening of the RAF Bomber Command Memorial in 2012, the cathedral had the only memorial in the United Kingdom dedicated to the 55,000 Bomber Command lost in the Second World War. During the war, 'priceless British treasures' were placed in a chamber sixty feet beneath the cathedral for safekeeping. According to the October 2016 edition of Cathedral Times from Lincoln Cathedral, £1.6 million a month is spent keeping the cathedral in shape; the most recent project completed has been the restoration of the West Front in 2000. About twelve years ago it was discovered that the flying buttresses on the east end were no longer connected to the adjoining stonework, and repairs were made to prevent collapse. The most recent problem was the discovery that the stonework of the Dean's Eye window in the transept was crumbling, meaning that a complete reconstruction of the window has had to be carried out according to the conservation criteria set out by the International Council on Monuments and Sites. There was a period of great anxiety when it emerged that the stonework needed to shift only 5 mm (0.20 in) for the entire window to collapse. Specialist engineers removed the window's tracery before installing a strengthened, more stable replacement. In addition to this the original stained glass was cleaned and set behind a new clear isothermal glass which offers better protection from the elements. By April 2006 the renovation project was completed at a cost of £2 million. Recently, concerns have been growing once more about the state of the West Front, as there has been some stonework falling, which has raised questions as to the effectiveness of the repairs carried out in 2000. The cathedral was used for the filming of The Da Vinci Code. Filming took place mainly within the cloisters, and chapter house, of the cathedral, and remained a closed set. The Cathedral took on the role of Westminster Abbey, as the Abbey had refused to permit filming. Although there was protest at the filming, the filming was completed by the end of August 2005. To make the Lincoln chapter house appear similar to the Westminster Chapter House, murals were painted on a special layer over the existing wall, and elsewhere polystyrene replicas of Isaac Newton's tomb and other Abbey monuments were set up. For a time these murals and replicas remained in the Chapter House, as part of a Da Vinci Code exhibit for visitors, but in January 2008 they were all sold off in an auction to raise money for the Cathedral. The cathedral also doubled as Westminster Abbey for the film Young Victoria, filmed in September 2007. Lincoln Cathedral is one of the few English cathedrals built from the rock it is standing on. The cathedral has owned the existing quarry, on Riseholme Road, Lincoln, since 1876. This quarry is expected to run out of stone in 2021. The cathedral's stonemasons use more than 100 tonnes of stone per year for maintenance and repairs. 1. The Blessed Virgin Mary. The Blessed Virgin Mary is the patron saint of this Cathedral church. The new statue was commissioned in 2014 and it makes for a beautiful photo if you stand in the arch by the choir screen and look down the south choir aisle. 2. The Fossils in the Nave floor. This is possibly Lincoln Cathedral’s most famous story. If you’ve already found the statue of the Blessed Virgin Mary then you are right where you need to be. Folk stories tell that the Lincoln Imp was a naughty little creature, causing havoc all around the Midlands. When he and his friends arrived at Lincoln Cathedral, some angels had had quite enough and turned him into stone to make an example of him. He’s high up at the top of one of the pillars and there’s a light you can turn on to help you see the way. If you’d like to see him up close, the Cathedral Gift Shop has lots of different Imp related items, including socks! Everyone who comes to Lincoln knows that Lincoln Cathedral’s Magna Carta is actually kept in the vault at the Castle. We like to tell the story too and you can get up close and personal with a copy of the document and read all about its story on your way to the Cloisters. Everyone has a mobile phone nowadays; in fact you are probably reading this on one. But before anything like a mobile phone was ever conceived, a man named George Boole was in Lincoln. He’s widely known as one of the forefathers of the technology we have today. The Cathedral has a window dedicated to his life in the Nave. If you find yourself wandering around the north choir aisle, you might come across the Cathedral Treasury. The Treasury is filled with fine pieces of silver from all around the Diocese of Lincoln. What is the oldest piece you can find? The mighty Father Willis Organ stands proud above the choir screen. Not only is it beautiful to look at, but it is also one of the finest instruments in the land. It has remained fairly true to what it was when it was built and hasn’t been messed around with very much over the years. The Father Willis is a true gem. The Apprentice Wall is found in the south choir aisle, next to the entrance to St Hugh’s Choir. This wall was created by the stone masons as they were learning their craft and skills. Each mason would have to carve a stone for the wall; you can see that there are all kinds of levels of intricacy to the Cathedral, especially here. As well as the flowers, what animal can you find carved into the blocks? 9. The Duncan Grant Chapel. On your visit you might notice that one of the smaller side chapels off the east end of the Cathedral is highly decorated. It’s unlike any others we have and depicts the biblical story of the Good Shepherd. It remained locked for 20 years, so it’s a real privilege to be able to come and see it today. There are lots of animals around, specifically lots of sheep. Why might this be? 10. Faces in the Choir Screen. If you go to the stone screen below the Father Willis Organ, you will see a tremendously intricate set of carvings in the stonework. At one time this would have been painted bright colours, but now we only see the stone as it would have been cut by the skilled masons. In the carvings you should be able to see some faces. We don’t exactly know what these faces are depicting but they are certainly a fun addition to the Cathedral! How many faces can you count? • Externally there are steps (fitted with hand rails) and ramps to enter and exit the cathedral. • Internally the cathedral is accessible via ramps, (with the exception of the side chapels). • Hearing loops are installed at various points in the cathedral, denoted by signage. • Accessible toilets are available, along with baby changing facilities. • Assistance dogs are welcome in the cathedral and grounds. A water bowl for dogs is available in the Refectory coffee shop. The nearest spending area is on the East Green at the rear of the cathedral; dog waste bins are situated at points around the cathedral, Bailgate and Nettleham Road. The cathedral’s grounds maintenance team inspect the external areas regularly and keep them clean. • All theirr front of house staff have undergone World Host Training, and staff and volunteers are trained to assist their visitors. • Stewards and the Visitor Services Team are on hand throughout the cathedral should you require any assistance. Stewards can be identified by their blue sash. For a full access statement please click here. *There will be exceptions to these opening times, click here for more information. Lincoln Cathedral is best explored with the help of one of our expert volunteer guides. Please contact the Visitor Services team if you have any specific requirements. To book your tour(s), you can visit the entry desk on the day or contact the Visitor Services team on 01522 561600. Please note, they can only take bookings made more than 24 hours in advance. If you are visiting today, please enquire at the Entry Desk on arrival. An introductory floor tour is included in your admission to the Cathedral. Let our expert volunteer guides take you on a journey, revealing hundreds of years of history. Duration : Approx. 1 Hour. No Maximum. No age restrictions. Their roof tour takes you up into the roof space of Lincoln Cathedral so you can see the building's inner workings. November - February: Monday to Friday: 1.30pm Saturday: 11.00am & 1.30pm. March - October: Monday to Saturday: 11.00am & 2.00pm. Duration: Approx. 90 Minutes. Maximum places = 14. Participants must be 14 or over due to health and safety reasons. Their Tower Tour takes you up to the top of the Central Tower where you can experience fabulous views and on a clear day see much of Lincolnshire. March - November: Saturday: 11.30am, 1.00pm & 2.30pm. Duration: Approx. 1 Hour. Maximum Places = 14. Participants must be 14 or over due to health and safety reasons. Education lies at the heart of Lincoln Cathedral. Explore our Medieval and Wren Libraries with the help of a guide. By arrangement, please contact the Librarian. Duration: Approx. 1 Hour. Number of Places = 20. There are no age restrictions on Library Tours. They would never want to turn anyone away and therefore if you are unable to pay there is no entrance charge before 09.00 or after 16.30, Monday to Saturday and all day on Sundays. An introductory floor tour is included in the admission price. Please enquire when purchasing your ticket for further details. Transport: Lincoln (National Rail) then 0.6 miles. Bus routes: Walk & Ride ‘Steep Hill Shuttle’ stops close by. Opening Times : See above. Tickets : Adults £8.00; Concessions £6.40; Children (5 - 16) £4.80. Tickets Cathedral + Castle: Adults £16.00; Concessions £13.00; Children (5 - 16) £10.00.